For the past eight decades, the only mission Bhagavan Baba has been engaged in is to raise the level of awareness of man from the mundane to the divine. And He has done this through His own life as well as His Teachings. Every discourse of Baba is patent with powerful messages delivered in a manner that is simple and lucid, practical and penetrating. Almost on every such occasion, Bhagavan begins with a poem and ends with a bhajan which is sung en masse. And the main message is conveyed through the elucidation of deep insights ably supplemented and illustrated with interesting and inspiring anecdotes; each of these tales is fascinating and worth ruminating over repeatedly. It is for this reason that we have culled out 85 such stories from the huge treasure of His divine discourses to present them in the form of quizzes. The first part which has 21 questions was published before the 85th Birthday celebrations, and here are another 9 taking the tally to 30. We hope this will serve you in revisiting His messages so that we can translate them into real virtues in our lives. “A rich businessman had four wives. The first one was continuously ill suffering from one disease or the other. The second was given to worldly pleasures. The third wife was always pursuing a spiritual path and was keen to meet learned people and learn about religious aspects. The fourth was very healthy and did not give in to worldly pleasures or have desires of any kind; she had only one thought and that was to become one with the Divine. “The businessman went to a foreign land and wrote to the four wives just before returning asking what they would like to be brought. The first wife replied saying she wanted a special kind of medicine for her illness. The second asked for special gifts like saris, jewels, etc. The third wanted religious books of the foreign land. The fourth wife had nothing to ask except the safe return of her husband. How does this story reveal God’s true Nature too? D. Always be prepared for God’s tests! 23. During the 1973 Summer Showers Discourses, Swami said: “Perhaps you think it is not easy to control our senses. Even if it is not easy to do this, it is very easy to divert all of them in the direction of God and give them a new orientation. The gopikas give classic examples of such supreme self-control. By directing the powers of your senses towards God, all the impurities of the senses are eliminated. The first step is cultivation of love towards all living creatures. This helps you to control your senses and direct them toward God. According to Swami, “Our life may be compared to a pond and the length of our life to the water…the fisherman is ___________”. 24. 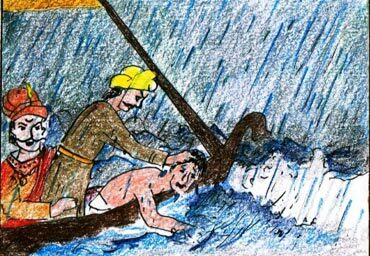 During a Divine Discourse delivered in 1986, Swami teaches us the spirit in which service should be rendered by narrating a small story: “A crowd of urchins were watching with glee the plight of the calf which was unable to move forward because of the slush. 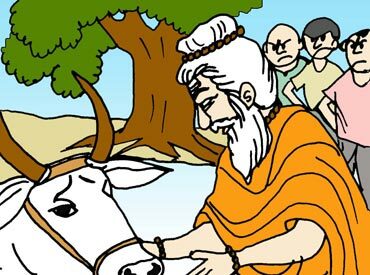 An ascetic who was passing by saw the poor state of the calf and taking it out of the mud, carried it on his back to the pool of water. A. Not giving up the service until it is completely done! B. Not advertising about it later! 25. During a Divine Discourse delivered in 1968, Swami narrated a story that teaches us the value of Divinity: “There was once a boy who picked up a precious gem, bright and round, and used it for playing marbles on the road with his comrades. A merchant dealing in precious stones chanced to pass along that path and his discerning eye fell on the gem. He approached the boy, took him aside and offered to pay him fifty rupees in exchange. If the boy knew the value of fifty rupees he would have known the value of the gem! He went to his mother and told her that a stranger had tempted him with fifty rupees in return for the marble he played with. She was surprised that it was so costly and she said, ‘Do not go out of the compound with it; play in the garden with your friend.’ When the value was revealed, limits were set. 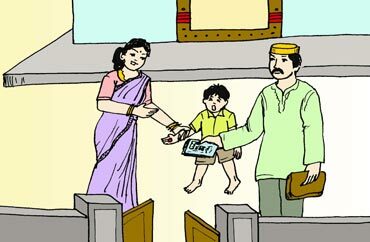 Later, when he was willing to offer even fifty thousand rupees, the mother took it to a bank and deposited it in their safety vaults. What lesson does Swami teach us here? A. We must always treasure precious stones! C. We must always be ready when God tests us through temptations! 26. During a Divine Discourse given in 1963, Swami narrated a story that teaches us the secret to leading a successful life: “The Dharma-karmas (virtuous actions) have to be done; there is no escape. Fleeing to the forest is no solution, for it only gives the situation a new turn. Your body may be in the jungle, but your mind will wander in the market-place! “There was once a sadhaka (spiritual seeker) who was initiated by a yogi into some manthram (holy words); he wanted to meditate on it undisturbed and found his home to be full of distractions. He fled to the forest and discovered a convenient tree, under which he could meditate. Before long, the birds roosting on its branches started to clamour aloud and they showered on his head their droppings. He was greatly incensed. ‘Have I no place where I can commune with God,’ he cried. ‘Children at home; birds and bats in the jungle! I shall immolate myself, get born under better auspices and then start sadhana afresh,’ he decided. When the old man pleaded him to be sensitive of the environment, the seeker then felt he had no freedom to die, so he returned home. 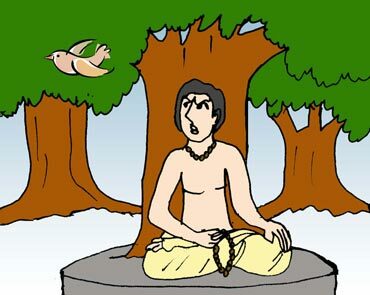 What lesson does Swami teach us through this story? A . Dharma is the most important thing! B. There is a time and place for everything! C. When in trouble, always seek a Guru! 27. During a Divine Discourse given in 1991, Swami reveals what happens when one does not have a strong determination and thus swerves from his devotion: “The scriptures refer to the human body as the temple and the indwelling Spirit as the God installed therein. Even a mere intellectual understanding of this fact will make us happy. But we shall be happier when we put this understanding into practice in our daily lives. However, it is a pity that we content ourselves with pious resolutions in such matters, without a strong determination to put them into actual practice. Here is a story relevant in this connection. According to Swami, what is a person who never swerves from his determination even under trying circumstances called? 28. 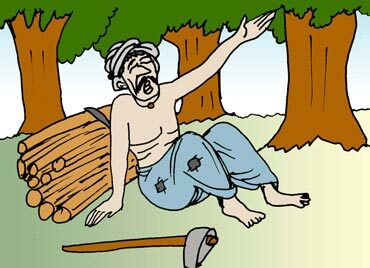 During a Divine Discourse given in 1974, Swami narrated a story that reveals the true nature of man: “Once there was a woodcutter who went daily into the forest and collected fuel which he sold in the village nearby for pittance; this just sufficed to keep his wife and children alive. One morning, while he was stepping out of his hut, the wife reminded him that it was the New Year festival the next day; she pleaded with him to collect a heavier bundle of fuel that day, so that they could get a few more paise to give the children a morsel of sweet rice each. The man nodded assent and walked on. “The Angel of Death took pity and appeared before him to fulfill his wish. But, the woodcutter suddenly receded; he cleverly changed the purpose of his appeal to the Angel. He had no wish to die, though in his despair he had called for her help. He said, ‘No. No. I had no one here to lift this bundle onto my head, so I called on you to come to my aid. That was the only reason behind my prayer. Please help me to lift this burden and place it on my head; I have to reach the village soon!" According to Swami, why is man’s will to live so strong? B. He enjoys being active! 29. During a Divine Discourse delivered in 1986, Swami reminded us: “The nature of the Sankalpa that motivates a person can be sensed by others. “The story of Ted Ross, a lone farmer in Holland, illustrates this quite well. 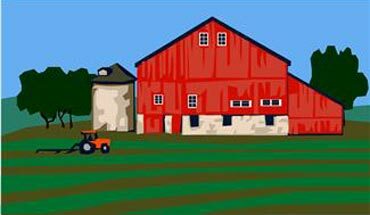 He left his home in order to live in peace and freedom and settled on a forty-acre farm in a cottage he built thereon. He had interest in poultry farming and raised chicken. Killing birds for food was part of the culture he grew in.